The ACS6 - a flexible solution for poultry houses. The new ACS6 climate and production controller is the sixth generation of high end climate and production controllers for the poultry industry from DACS. The new ACS6 climate and production controller is the sixth generation of high end climate and production controllers for the poultry industry from DACS. Thirty years of experience and knowhow from the industry, together with the latest trends, makes the ACS6 a power full package for climate control in poultry houses and enable farmers to optimize even more on the in-house climate and production. Full scale tests conducted show that the in the ACS6 enable farmers to cut heat consumption in a standard poultry house by 30% - simply via new soft ware solutions that determine the “dehumidification potential” on the basis of inside and outside climatic conditions, and ensure a much gentler and more energy efficient drying process in a poultry house. If set point on humidity is lower than the RH on the incoming air from the ventilation system, a traditional climate controller will add heat or increase ventilation levels in an attempt to get back to set point in the poultry house. Very often this process is futile and will only lead to higher ventilation rates and increased heat consumption in an attempt to keep settings. This dehumidification process does not benefit the production of poultry – it only adds costs. The ACS6 climate and production controller automatically eliminates this excess heat consumption - and many frustrations over wasted money. The ACS6 keeps track of all parameters and users for an indefinite period of time. The ACS6 screen menu can be defined specifically to the needs of each person allowed access, so unskilled persons will never be able to enter menus where critical parameters can be adjusted. An important feature for large scale poultry operations, since each and every employee only has access to parameters concerning his function in the poultry production. 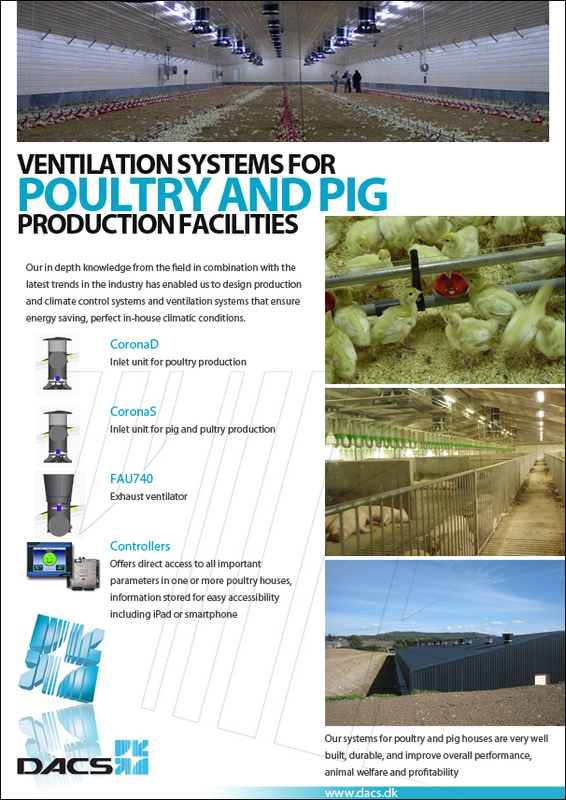 The ACS6 is extremely powerful and designed to run any type of ventilation system for poultry production. Via the ACSnet management system any ACS6 climate and production controller can be accessed via the internet - but only with passwords. When online parameter can be adjusted in accordance with his function in the poultry production.